Africa, 202 BC. As in the First Punic War, Rome finally attempts to end the second with an invasion of Africa. Scipio scores early success at Utica and beyond, forcing Carthage into a peace treaty. 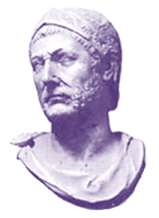 But in an ill-fated change of heart, the Carthaginian senate recalls Hannibal from Italy to continue the war. When Hannibal lands in Africa to face down Scipio, the quality of the two armies stands in stark contrast. The armies may be roughly equal in size--about 35,000 men each--but Scipio enjoys a notable advantage in veteran infantry and has a significant contingent of Numidian horse on his side. Can Hannibal save Carthage and expel the Roman invasion?